An example is the surplice controversy. We have all encountered Christians who are opposed to celebrating Christmas on the grounds that (a) the Bible nowhere commands us to celebrate Christmas, and does not mention the 25th of December; and (b) the pagans had a festival in December at which they built fires and feasted and exchanged gifts, from which it follows that those who celebrate Christmas are participating in pagan rites. Similarly, in the late 1500’s and early 1600’s, there were Christians in England who objected to the garment called the surplice. When participating in the services of Morning and Evening Prayer in Church, clergy, including choir members, normally wore a cassock (a black, floor-length, fairly tight-fitting garment) covered by a surplice (a white, knee-length, fairly loose garment with loose sleeves). The Puritans objected to the surplice (a) as not mentioned in the Bible, and (b) as something that the Roman Catholics had worn before the Reformation, which made it one of the props of idolatrous worship, and marked anyone who wore it as an idolater. 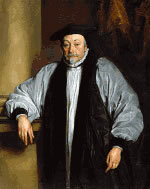 Archbishop Laud regarded it as a seemly, dignified, garment, an appropriate response to the Apostle Paul‘s injunction, “Let all things be done decently and in order.” The Puritans stood by their objections, and violently interrupted services at which the surplice was worn. 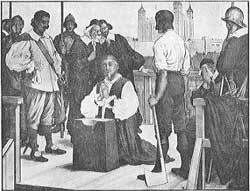 On one occasion, a group of Puritans broke into an Oxford chapel the night before a service and stole the surplices, which they thrust into a the dung-pit of a privy. Again, a woman marched into Lichfield Cathedral, accompanied by the town clerk and his wife, and ruined the altar hangings with a bucket of pitch. Under English Law, it was part of Laud’s office as Archbishop to maintain order and to punish offences against the peace of the Church. He made it his practice to proceed not only against poor and obscure offenders, but also, perhaps especially, against rich and powerful ones. It is well that men should be equal before the law, but his integrity on this point ultimately cost Laud his life. This entry was posted in A Great Cloud of Witnesses and tagged Alternative Service Book, American Revolution, Andrew Burnham (priest), Anglican Communion, Anglicanism, Anne Gorsuch Burford, Appeal, Archbishop, Archbishop of Canterbury, Associated Press, Bachelor of Science, Baroque, Ben Bradshaw, Book of Common Prayer, Catholic Church, Christianity, Christmas, Church of England, France, House of Bishops, Jesus, London, Martyr, San Francisco Bay Area, Supreme Governor of the Church of England, William Laud. Bookmark the permalink.